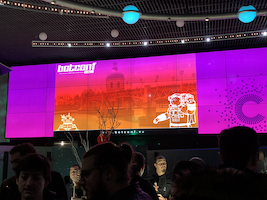 I’m just back from the reception that was held at the Cité de l’Espace, such a great place with animations and exhibitions of space related devices. It’s tie for my wrap-up of the second day. This morning, after some coffee refill, the first talk of the day was performed by Jose Miguel ESPARZA: “Internals of a Spam Distribution Botnet“. This talk had content flagged as a mix of TLP:Amber and TLP:Red, so no disclosure. Jose started with an introduction about well-known spam distribution botnets like Necurs or Emotet: what are their features, some volumetric statistics and how they behave. Then, he dived into a specific one Onliner, well known for its huge amount of email accounts: 711 millions! He reviewed how the bot is working, how it communicates with its C&C infrastructure, the panel, the people behind the botnet. Nice review and a lot of useful information! The conclusion was that spam bots still remain a threat. They are not only used to drop spam but also to deliver malware. Spam email > Internet shortcut > VBS control panel > C&C > Download & execute > Flawed Ammyy. The core component that was analyzed is the VBS control panel that is accessed via SMB (file://) in an Internet shortcut file. Thanks to the SMB protocol, they get access to all the files and grabbed also payloads in advance! The behaviour is classic: hardcoded C&C addresses, features like install, upgrade, kill or execute, watchdog feature. Interesting, the code was properly documented, which is rare for malicious code. Different version were compared. At the end, the malware drops a RAT: Flawy Ammyy. Why “Social engineering”? Since Office 2007, macros are disabled by default and the attacker must use techniques to lure the victim and force him/her to disable this default protection. This was a very nice study and recap about malicious documents. For each techniques, Tom described what to log and how to search events to spot the bad guys. The third technique was covered deeper with more examples to track many common evasion techniques. They are not easy to describe in a few lines here. My recommendation, if you are dealing with this kind of environment, is to have a look at Tom’s slides. Usually, he publish them quickly. Excellent talk, as usual! The Rustam Mirkasymov’s talk was the last one of the first half-day: “Hunting for Silence“. There was no abstract given and I was thinking about a presentation on threat hunting. Nope, it was a review of the “Silence” trojan which targeted financial institutions in Ukraine in 2017. After a first analyze, the trojan was attributed to APT-28 but it was not the case. The attacker did not have the exploit builder but was able to modify an existing sample. Rustam did a classic review of the malware: available commands, communications with the C&C infrastructure, persistence mechanism, … An interesting common point of many presentations for this edition: slides usually contained some mistakes performed by the malware developers. The key is speed! Finally, another key point was to request for more collaboration between security researchers and law enforcement. The next speaker was Dennis Schwarz who presented “Everything Panda Banker“. The name is coming from references to Panda in the code and the control panel. The first sample was found in 2016 and uploaded from Norway. But the malware is still alive and new releases were found until June 2018. Dennis explained the protections in place like Windows API calls resolved via hash function (obfuscation technique), encrypted strings, how configurations are stored, the DGA mechanism and other features like Man-in-the-Browser and Web-Inject. Good content with a huge amount of data that deserve to be re-read because the talk was given at light speed! I even had no time to read all the information present on each slides! Thomas Siebert came to present “Judgement Day”. Here again, no abstract was provided but the content of the talk was amazing but released as TLP:Red, sorry! But, trust me, it was awesome! Kamino: steals usernames and passwords, exfiltrate via HTTP, C&C can be upgraded remotely, XOR encrypted, attacker can login as root, anti-logging, victim identified by UUID. Kessel: has a bot feature: commands via DNS TXT an SSH tunnel between the host and any server. From a remediation perspective, the advices are always the same: use keys instead of passwords, disable root login, enable 2FA, monitor file descriptors and outbound connections from the SSH daemon. Evil maids attack (hotel room) -> Power-cycle counts via boot_check.py! The best lightning talk was (according to the audience) the TLP:Red one (it was crazy!). I really liked boot_check.py, a simple Python script that can detect if your computer was rebooted without your consent. That’s all for today, see you tomorrow for the third wrap-up!